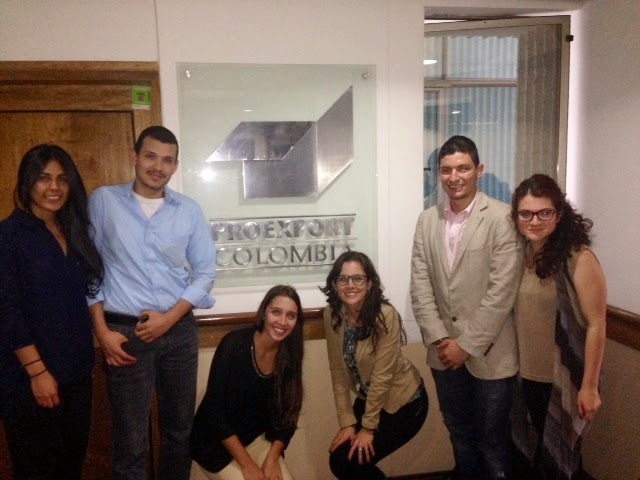 El miércoles 26 de Marzo 2014, el Observatorio en Comercio, Inversión y Desarrollo visitó las instalaciones de Proexport en Medellín. Este encuentro fue de gran importancia puesto que le permitió al equipo entender la importante tarea que tiene esta institución en “la promoción de las exportaciones no tradicionales en mercados con potencial, la atracción de inversión extranjera directa en Colombia y el posicionamiento del país como destino turístico de talla mundial” (Proexport, 2013). Esta labor se realiza a través del servicio a cuatro diferentes sectores: agroindustria, prendas de vestir, manufacturas, y servicios. Durante la visita, conocimos los servicios de información y adecuación de la oferta exportable que ofrece la oficina regional. A través de este acompañamiento, una empresa ya consolidada, con capacidad productiva y conocedora del mercado objetivo al que desea ingresar, puede acceder a las herramientas comerciales para identificar clientes concretos. Este proceso no se trata de darle a la compañía una base de datos genérica de su sector, sino de buscar el cliente que mejor se ajusta a su oferta exportable; así, la empresa oferente se convierte en un negocio que la oficina de promoción del turismo y las exportaciones no minero-energéticas (antes conocidas como tradicionales) del país recomienda, lo cual sirve como garante de la relación comercial entre ambas partes. Esta relación tan cercana que alcanza Proexport con las empresas, le ha permitido identificar ciertos retos que tienen hoy las empresas colombianas en sus procesos de internacionalización. El primero de ellos está relacionado con la falta de personal calificado para la exportación y los negocios internacionales dentro de las empresas, no por falta de oferta de este tipo de profesionales, sino debido a la poca consciencia que tienen algunos empresarios acerca de asignar a la internacionalización un profesional en esta área. Otro de los grandes retos continúa siendo el bilingüismo, el cual se convierte en un obstáculo para el comercio fuera de América Latina y el verdadero aprovechamiento de los tratados de libre comercio. En el sector de la agroindustria, los principales retos están relacionados con el tipo de modelo productivo del país: una gran cantidad de intermediarios en la cadena productiva, que dificulta la aplicación de buenas prácticas en todos los eslabones. La no aplicación de las buenas prácticas agrícolas se traduce en falta de competitividad, en gran medida por la carencia de certificaciones internacionales (GAP, de producto orgánico, Fair Trade, Rainforest, entre otras) que son actualmente imprescindibles a la hora de llevar los productos al exterior, puesto que a pesar de que estas barreras técnicas no son “obligatorias”, algunos países e industrias no están dispuestos a negociar fuera de estas condiciones. Participar en los mercados internacionales es una de las grandes demandas que tienen hoy las empresas colombianas; gracias a Proexport esta tarea es cada vez más fácil, sin embargo, un compromiso verdadero con la profesionalización de los procesos de internacionalización y la mayor competitividad es vital para alcanzar presencia internacional. *Economics and International Business Student at Universidad EAFIT, Colombia. For the last eight months this observatory has dedicated its entire efforts on explaining the benefits of trade, the challenges and advantages of global value chains, the main challenges for developing countries to establish a truly beneficial trade policy, and moreover, this nine-member group has try to transmit the idea of a strong link between a country’s social and productive investment and its trade and development achievements. By analyzing all the previous articles written by members of the observatory, it becomes evident that our last goal is to provide structured ideas on economic policy, which can beneficially impact each member of society. Taking this into account, the idea of studying a region thatis so incredibly endowed with natural resources, but has not been able to transform it into a substantial economic development, becomes an extremely interesting challenge. Therefore the purpose of the series of publications that I am about to start, will be focused on how to unlocked African private sector dynamism to promote trade and ultimately economic development in the region. Although since the 2012 African Union summit, governments in the region have shown interest in making a bigger effort to exploit intra-African trade, as they recognize it as an opportunity to generate employment, catalyze investment and foster growth, the level of trade, giving African factor endowments, it’s still extremely below its potential (UNCTAD, 2013). One of the main reasons for this trade underdevelopment, it’s that the measures taken until now to promote intra-trade have been based on the reduction of trade barriers, but small efforts have been made to enrich countries productive capacities, therefore there is no sufficient supply of goods to increase exports. Moreover, there has not been a strong plan to incorporate the private sector in the process of trade liberalization and intra-African trade. This has caused a generalized unawareness within the enterprises about the diverse opportunities and challenges to build up a bigger productive capacity, that provides them higher benefits. Bearing this in mind, the following reports will concentrate first on the detailed explanation and analysis about Africa’s current trade data, and then, will move to the structured policies needed to take advantage of the already made tariffs and non-tariffs reduction, which will hopefully rebound positively on that 48% Sub-Saharan population that still live under $1.25 a day. Economics student at Universidad EAFIT, Medellin-Colombia. Few has been written about the free trade agreement (FTA) between the State of Israel and the Republic of Colombia, and that appears to be unexplainable since this FTA is completely beneficial for both countries. Israel is a relatively new State, with only 66 years it has reached an incredible level of development. Additionally, its GDP per capita (US $32,212)1 makes it a very interesting market with a high purchasing power and great opportunities for Colombian goods to be sold. There are no sectors that can be harmed because of the complementarity of the economies. Israel will offer cheaper technology to Colombian farmers and industries. Hopefully, our productivity and efficiency will increase, which would lead to greater international competitiveness and therefore a rise in both trade and foreign direct investment. In addition to this, “Israel also counts with a two-way cooperation framework which will allow the development of projects in priority areas, such as the technification of the agriculture, innovation, telecommunications, biotechnology and the development of environmental technologies, in which Israel is a global leader” (Portafolio.co, 2013). Furthermore, in the article 5.2, numeral d) of the text of the agreement it says that the parts have given special attention to the strengthening of SMEs (Small and Medium Enterprises) (MinTIC, 2013). The fact that this kind of economic agents are being enhanced and accompanied by a foreign government and supported by the chance of getting cheaper technology, certainly leads the country to grow more in economic terms. Seeking for this kind of agreements which are completely beneficial for our country is a priority for the government. And of course, is a fundamental duty of the government to make sure that the gains obtained from these agreements are being well distributed in pro of the development. Ministerio de Comercio, Industria y Turismo. Acuerdo comercial entre Colombia e Israel. Available in: http://www.tlc.gov.co/publicaciones.php?id=2007. Ministerio de Comercio, Industria y Turismo. Texto del Acuerdo- Español. Available in: http://www.tlc.gov.co/publicaciones.php?id=8077. Portafolio.co (2013). Colombia e Israel firmaron el TLC. Available in: http://www.portafolio.co/economia/colombia-e-israel-firman-el-tlc. World Trade Organization. The case for open trade. Available in: http://www.wto.org/english/thewto_e/whatis_e/tif_e/fact3_e.htm. 1. GDP per capita for 2012, taken from “Ministerio de Comercio, Industria y turismo”. 2. Conference “Agreements and FTA between Israel and Colombia”. February 19/2014. Universidad EAFIT, Medellin-Colombia. After a few days since the past legislative elections in Colombia, I feel the calm necessary to make an analysis of the scenarios it sketched for the nation’s forthcoming years. That calm can gain stronger basis now, after the official release of the Colombian economic growth in 2013 (4,3% (Portafilio, 2014)). But, before starting the argument, it is crucial to announce that the following analysis will be speculative, due to the fact that Registraduría Nacional have not published yet the official conformation of the congress, even though the pre-counting can be taken as a trustful outline. The pre-counting of the national register agency of Colombia shows a scenario of continuity to the current government coalition, for the sum of 23.76 % of the votes (Registraduría Nacional, 2014) in Senate, and a steady 37.84% in the chamber of representatives. This trust backup to the current government, whose focus has centered in the stabilization of the economy, and the improvement of the Nation’s international relations (both economic and political), could drag to the country more investment, due to the government’s efforts to maintain a stable economy. The present national government had had to face many economic instabilities. First, by receiving an economy just getting out from a decrease of 5.2 perceptual points between 2007 and 2009, managing to get up since its entrance in office (2010) 2.6 points. Second, the 2012 deceleration, due the various internal problems of the agro strike, and the dependency on commodities of the extractive industry. In 2012, the stronger sector was mining, with a 5,9 % share (Dinero, 2013). But mining was also the strongest one in 2011 with a share of 14,3 %, and then it was the principal cause of a high overall growth up to 6.6 % (see Table I). Fortunately, the 2013 growth goes out of that dependence, bringing with it, construction as the leading sector (a share of 9,8 %), followed by social services, and agro (5,3 % and 5,2 % respectively). Then, mining comes just fourth (4,9 %) (Portafolio, 20014), and perhaps, it is the first step towards a new economic tendency. But I am not referring to construction as the sector in which the national economy should be focus (that could turn into a real sate bubble). The interventions of the current government have been able to construct a stable economic structure that has sketched a good forthcoming for development. It could be foreseen in how the composition of the former year economic growth opens the doors to a more diversified economy, which central sector are intensive in the productions of labor, and therefore the split of the wealth. Which parties are Unidad Nacional, Partido Liberal, and Cambio Radical. It is important to say that part of the Partido Consevador is aligned with the government, but for the present analysis it is better to left them out, because the number of conservative congressman that will join the ruling alliance is still uncertain.